During this Year of Mercy, we would like a parishioner [elderly/sick/housebound] to represent the parish on the Diocesan Pilgrimage to Lourdes. If you would like to attend or know someone who would be willing to go, then please have a word with Fr. Michael. If you would like to make a donation to help this happen, then please place in an envelope marked ‘Lourdes 2016’. Year 11+ - A great week of faith, service, fun and friendship for the young people of our diocese, 21-30 July 2016. Deadline for applications: 28 February 2016. Book on-line now at www.castleriggmanor.co.uk/yatm-events. The parish will assist in funding this pilgrimage for any young person interested in attending. Ash Wednesday [the beginning of Lent], a day of fasting and abstinence, will be observed on Wednesday 10th February. Mass with imposition of Ashes will be celebrated at 9.15 am at St. Margaret Mary [school Mass] and 5.30 pm at Christ the King. Attendance last weekend was 228 [68+68+92]…snow perhaps? Thank you for the offering, which was £733.57. On Monday evenings at 6.00 pm - please come along to pray for this important intention. First Holy Communion will be celebrated in the parish on Sunday 5th June 2016. Preparation of candidates will begin on Thursday 4th February. Regular attendance at Sunday Mass is an essential part of the preparation. Each year since 1954, members of parishes in Carlisle and district have joined together and gone on pilgrimage to the National shrine of Our Lady of Walsingham in Norfolk. Dates this year: Tuesday 29 March – Friday 1 April. It is spiritually fulfilling, interesting, enjoyable and inexpensive! The cost includes accommodation, all meals, tips and coach travel. If you would like to know more about joining our pilgrimage from 29th March to 1st April 2016, please contact Jo Muter for further information on 524087 or email: jemuter47@gmail.com. This will take place for the deanery at Our Lady and St. Joseph’s Warwick Square on Saturday 27th February 11.00 am - 4.00 pm. Led by Sr Mary Julian RSM. Takes place at temporary site of Newman School [Pennine Way] on Mondays at 4.00 pm. Will meet at St. Margaret Mary on Tuesday evening at 7.30 pm - the theme this month will be the Shroud of Turin - all welcome. Why not give it a try? 24 Hours with the Lord - up for a challenge? 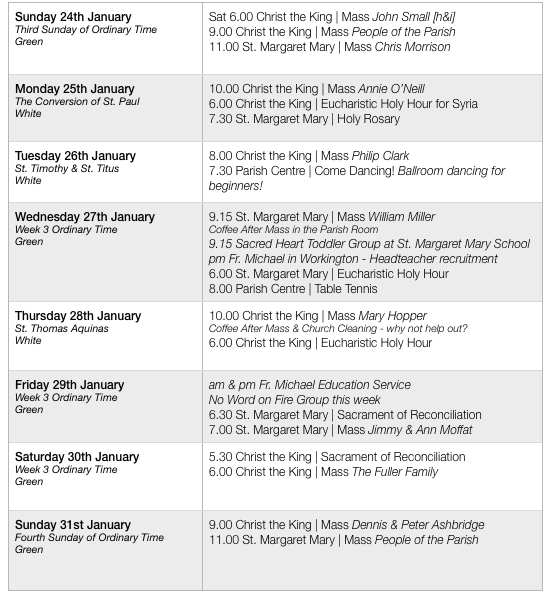 On Friday 4th March - Saturday 5th March the parish will join with churches throughout the world in having a period of adoration lasting 24 hours. So that our primary school can be involved, this will be hosted at St. Margaret Mary beginning with Mass at 10.00 am. The Sacrament of Reconciliation [with visiting priests] and periods of prayer for particular intentions will be celebrated throughout the 24 hours. We will need people to come forward to ‘watch’ during the night - are you up for the challenge? The play by T. S. Eliot will be performed by Classic Theatre Cumbria from Thursday 10th – Saturday 12th February in Carlisle cathedral in aid of the Mayor’s Charity Fundraising. For details and tickets, call 07970 673236 or email: info@classictheatrecumbria.co.uk. Sister Mary Julian RSM will reflect on principles and practicalities for The Year of Mercy by looking at the “Beatitudes”. The next talk is on Tuesday 16 February at 7.00pm, St Margaret Mary’s Parish Centre: Blessed are the poor in spirit. After its winter break - Faith on Tap should resume on the first Thursday of March. We wish parishioner Sean Crilley well in his new position at Walkers Funeral Directors. When celebrating funerals, I am always impressed by Sean’s manner and attention to detail - particularly his regard for Catholic teaching. The Diocese is desperate for young people to also attend the Lourdes pilgrimage - details below. Attendance last weekend was 176 [45+55+76]…snow perhaps? Thank you for the offering, which was £517.66. Bilingual Prayer Books and Readings - Bilingual prayer books are available in both churches for use during the celebration of Holy Mass - in Polish, Spanish and Portuguese. We are asking for Your support to pray for a change of heart for the men and women of violence in Syria and for their victims. 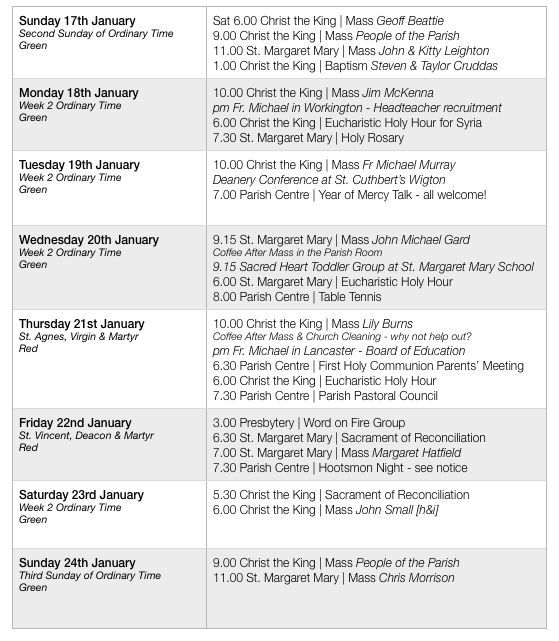 There will be adoration between 6.00 and 7.00 pm in Christ the King Church every Monday. We hope you can spare some time to join us. Sr Gerald & Sr. Maureen. A gathering to study the gospel of the preceding Sunday - all welcome. Fridays at 3.00 pm in the Presbytery at Christ the King. Each year since 1954, members of parishes in Carlisle and district have joined together and gone on pilgrimage to the National shrine of Our Lady of Walsingham in Norfolk. Dates this year: Tuesday 29 March – Friday 1 April. It is spiritually fulfilling, interesting, enjoyable and inexpensive! The cost includes accommodation, all meals, tips and coach travel. When requesting items be placed in the newsletter via email, please include ‘Parish Newsletter’ in the subject line - it prevents things getting lost. Many thanks. … using the past creatively to enhance the present. Do you enjoy reminiscing and socialising? Come along and join in fun and friendly creative reminiscence sessions aimed at stimulating memory and enhancing well-being. St Augustine’s Church Social Room - Mondays 2.30-3.30pm (use the Briar Bank entrance to the car park.) For more information about the creative reminiscence programme, please contact Susan Child, on 016973 32946/075311 68218 or email: susanch@creativehorizonscumbria.co.uk. Monthly days of worship, prayer and praise. The next date is Saturday January 30th at St Edmund’s Church, Orton Rd, Carlisle. All welcome. Renewal days start at 11.00 am and finish around 4.00 pm. Please join us even if you cannot stay for the full day. Tea and coffee provided. Please bring a contribution to a shared lunch. Contact: Janice Wrench on 01768 868489. Pope Francis calls us during this Year to prayerfully focus on three main aspects: recognising God’s mercy, receiving God’s mercy and becoming more merciful ourselves. 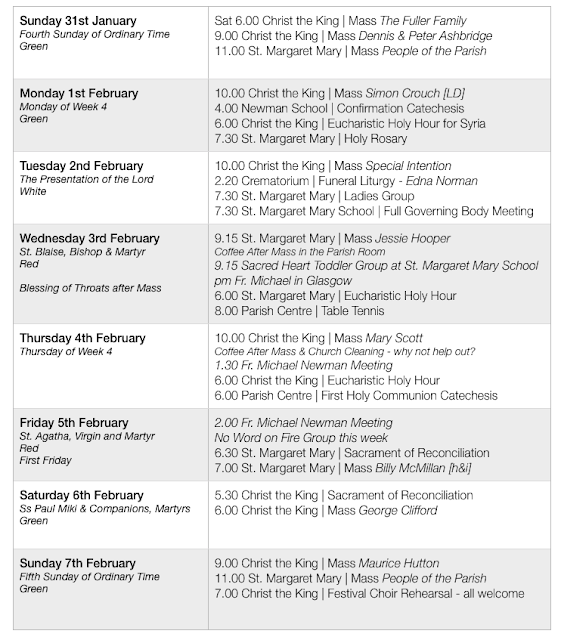 There are going to be a series of talks by Sister Mary Julian RSM over the next few months. Sister is looking at the Principles and Practicals for THE YEAR OF MERCY by looking at the “Beatitudes”. There will be a talk once a month and there is no charge for admittance. A parish social on Friday 22nd January at 7.30 pm in the Parish Centre - Haggis Neeps and Tatties….the Haggis will be addressed! Sing and dance to J2B Duo. Tickets available from Douglas. Attendance last weekend was 215 [55+85+75]. Thank you for the the offering which was £743.48. Many thanks to those who supported our appeal for items for our food parcels. We were able to distribute 33 food parcels to local families. In addition, we have also sent more clothing to Carlisle Action for Calais. Thank you once again for your generosity. Please continue to support this worthy initiative via the basket in the porch at Christ the King. We have been asked by the Carlisle Food Bank if we can particularly supply items with a high protein content like UHT Milk, tinned meats and/or fish etc. There is a basket in the porch for items at Christ the King. Year 11+. A great week of faith, service, fun and friendship for the young people of our diocese, 21-30 July 2016. Deadline for applications: 28 February 2016. Book on-line now at www.castleriggmanor.co.uk/yatm-events. The parish will assist in funding this pilgrimage for any young person interested in attending. Thank you for requesting that Masses be offered for specific intentions. A high volume has been received in recent weeks - please be patient: Masses will be offered for those intentions as soon as possible. Please give plenty of notice (at least one month’s) for a specific date. On Wednesday mornings from 9.15 at St. Margaret Mary School. First Holy Communion will be celebrated in the parish on Sunday 5th June 2016. There will be an initial meeting for parents on Thursday 21st January 2016 at 6.30 pm in the Parish Centre and preparation of candidates will begin on Thursday 4th February. Regular attendance at Sunday Mass is an essential part of the preparation. Each year since 1954 members of parishes in Carlisle and district have joined together and gone on pilgrimage to the National shrine of Our Lady of Walsingham, in Norfolk. Dates this year: Tuesday 29 March – Friday 1 April. Churches Together in Carlisle and District have organised a ‘Prayer Meeting with Faith Tea’ on Wednesday 20th January 7.00 -10.00 pm at Cornerstone [62-66 Denton Street CA2 5EH]. Please bring some food to share. Takes place at temporary site of Newman School [Pennine Way site] on Mondays at 4.00 pm. The directory is slightly ‘out of date’ and the figure is 66 priests working in the 110 parishes of the diocese: as you know, a number have commitments beyond parishes! Please pray for vocations to the priesthood in the diocese. Attendance last weekend was 197. Thank you for the offering of £751.88. Year 11+. A great week of faith, service, fun and friendship for the young people of our diocese, 21-30 July 2016. Deadline for applications: 28 February 2016. Book on-line now at www.castleriggmanor.co.uk/yatm-events. The parish will assist in funding this pilgrimage for any young person interested in this. Thank you for requesting that Masses be offered for specific intentions. A high volume has been received in recent weeks - please be patient. Masses will be offered for those intentions as soon as possible. Please give plenty of notice (at least one month’s) for a specific date. Bilingual Prayer Books and Readings. We are asking for Your support to pray for a change of heart for the men and women of violence in Syria and for their victims. 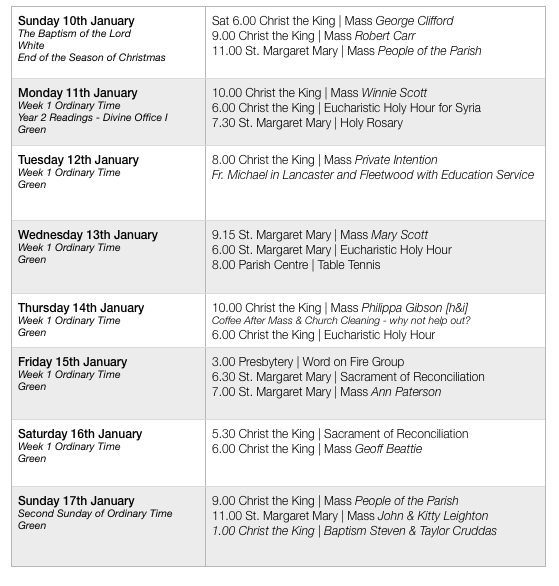 There will be adoration between 6.00 and 7.00 pm in Christ the King Church every Monday. We hope you can spare sometime to join us. Sr Gerald & Sr. Maureen. Resumes on Friday 15th January at 3.00 pm. If you would like to know more about joining our pilgrimage from 29th March to 1st April 2016, please contact Jo Muter for further information on 524087 or jemuter47@gmail.com. The Waterton Hall at OL&SJ is hosting a café where people living with dementia, their families and carers can meet to socialise and share experiences in a relaxed and informal atmosphere. Second Wednesday of each month 10.00 am – noon. See the poster for more details. Please make a note in your diaries and make an effort to attend - especially the ones in our own parish centre! Takes place at the temporary site at Newman School (Pennine Way) on Mondays at 4.00 pm.